If Ametsa with Arzak Instruction is going to win any prizes, the gong for unlikeliest name is theirs for the taking. It is the London outpost of 3 Michelin-starred Arzak, the San Sebastián restaurant co run by Elena Arzak – voted Veuve Clicquot World’s Best Female Chef in 2012 – and her father Juan Mari Arzak. I have recently returned from a short trip to San Sebastián (its Basque name is Donostia) which has an extraordinarily sophisticated informal food culture as well as being regarded as Spain’s top food destination. So I was really excited about my trip to Ametsa. The food at Ametsa is described on their website as ‘New Basque Cuisine’, ‘pairing the earthy flavours and techniques of Spain’s Basque region with modern, surprising twists featuring locally-sourced and organic produce from land and sea.’ This set the scene for something cutting edge but still gutsy and full of flavour. 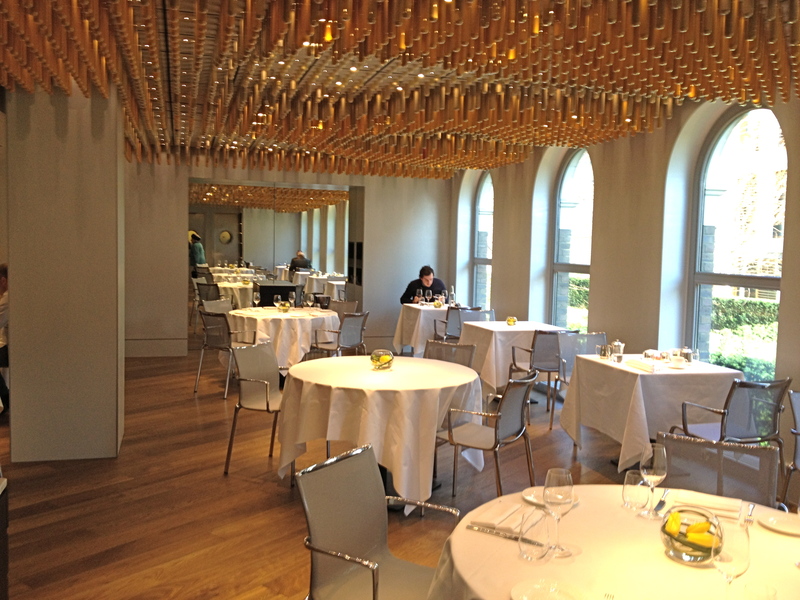 The room is light and airy with white walls, metal chairs, red banquettes and wooden floors. It overlooks a modern urban garden and the most distinctive feature is on the ceiling-an array of glass tubes filled with spices. It looks a bit like a row of oversized suppositories. I was lunching with her Ladyship and we nibbled on rather over-crusty bread and butter and sank a couple of glasses of Louis Roederer Brut Premier whilst we checked out the food offer. We went for the Lunch Tasting Menu with wine (£52 or £68 including wine for three courses with two options at each course). It didn’t seem particularly good value with low cost ingredients such as mackerel and ox cheek and didn’t offer much if any price advantage on the a la carte choices. Just for reference the price for the the set lunch at Pollen St Social is £29.50 for 3 courses with similar ingredients. For £55 you can get 6 courses at Roganic (see our review). But as it was billed as a tasting menu it seemed appropriate to put ourselves in the hands of the Arzaks-so we went for it. 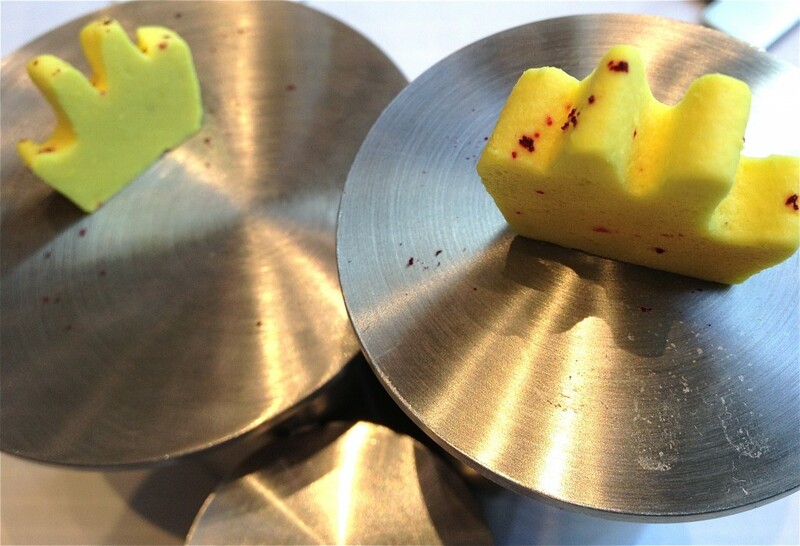 A couple of ‘aperitivos’ arrived reminiscent though in no way as interesting as the ‘snacks’ at El Bulli. 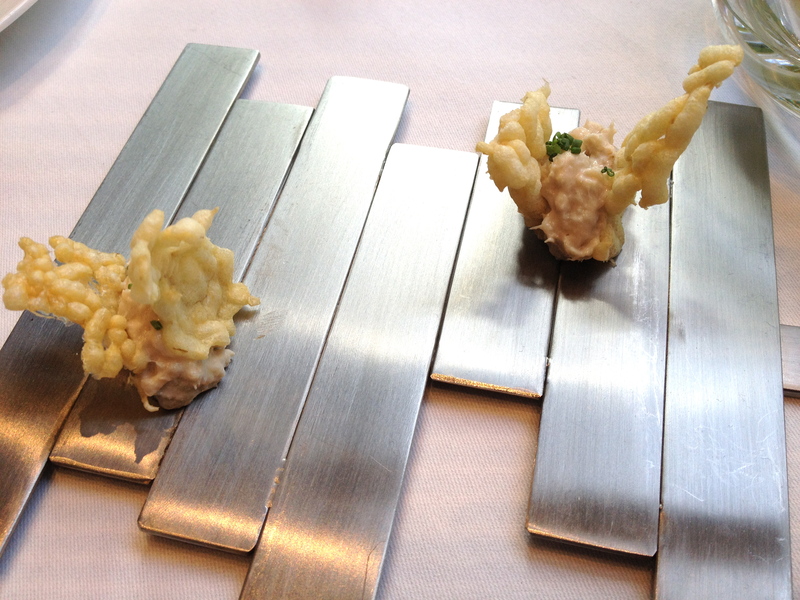 Rice with fish mousse was an agglomeration of puffed rice with a dollop of rough fish mousse on top. The mousse tasted fine-the sort your mum might have rustled up in the 70s whilst wearing a Frank Usher floaty number- but the construction fell to pieces as soon as it was picked up leading to an annoying sketch where we were failing to pick bits of mousse off the tablecloth with crumbling rice puffs. Cheese Puzzle with Turmeric was a puzzle. The puzzle was why would anyone want to serve it? It was rubbery with a vague aftertaste of processed cheese. It wasn’t witty, modern, post-modern or ironic-just a waste of plate space. Things picked up with my starter of Asparagus and Artichokes. Gently poached, the vegetables had a terrific depth of flavour and a sensuous mouth feel. 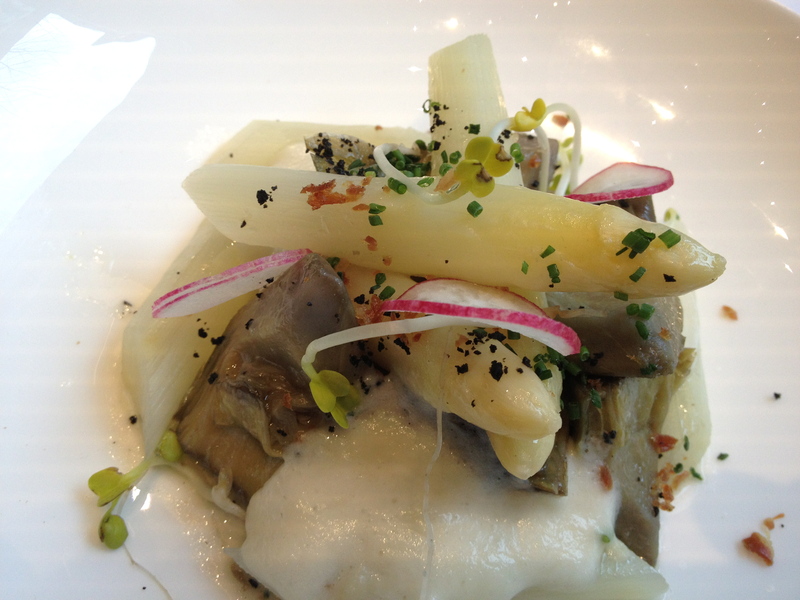 In this instance the white asparagus was a better call than our domestic green as a foil to the artichoke. Her Ladyship went for ‘From Egg to Chicken’. 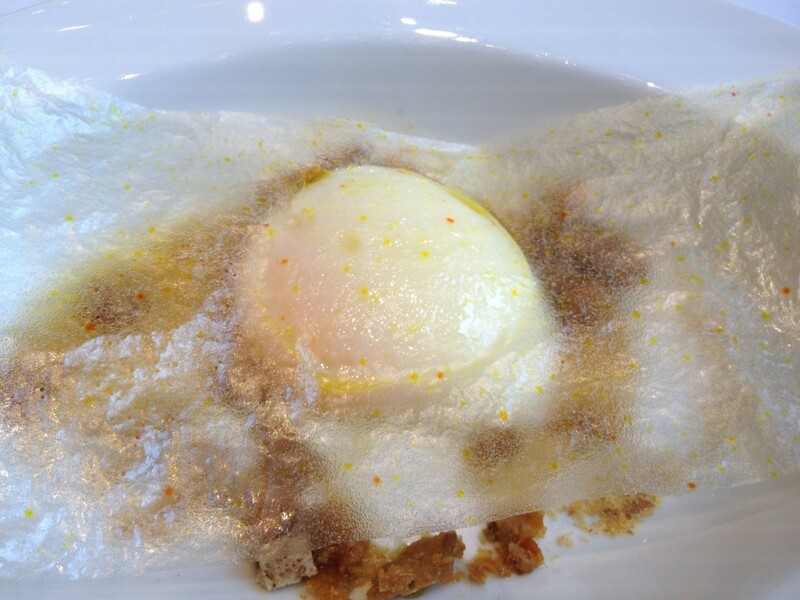 This was a much more conceptual dish with a slow poached egg sitting on what I think were dehydrated chicken flakes and covered with an opaque sheet made out of seaweed. A warm stock is then poured on top and the egg is meant to scramble. However the liquid wasn’t hot enough and the egg didn’t do what it was meant to leaving a rather gloopy mess that tasted of very little. At this level and price it wasn’t good enough. With our starters we were drinking a very crisp and minerally tasting Albariño-La Liebre y La Tortuga (the hare and the tortoise) from the Rias Baixas area in the north-east of Spain. For our mains her Ladyship chose Ox cheek with Vanilla. 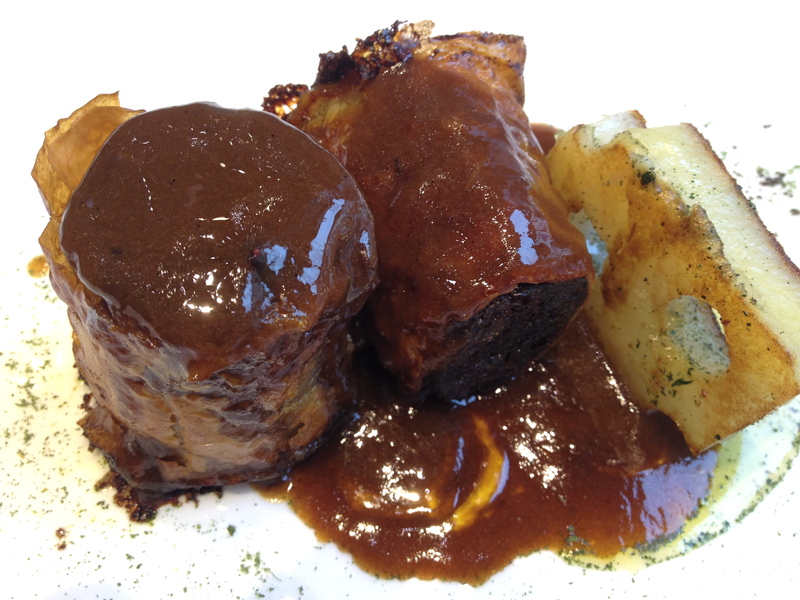 The meat was flaked, wrapped in filo pastry and served with a sauce which she described as being like an oily gravy. This dish was a success, the ox cheek was very tender with a taste similar to bison and it was a substantial main course. 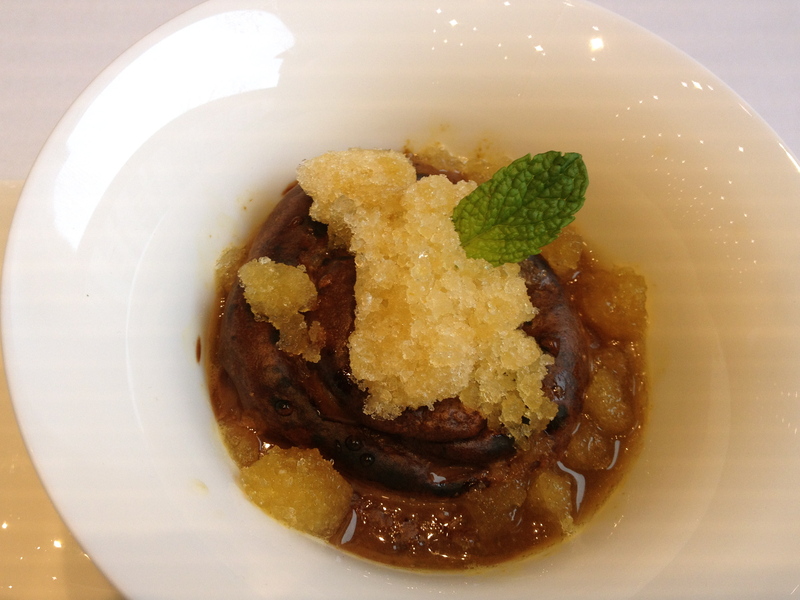 She accompanied the dish with a wonderful Hito, 2009, Ribera del Duero. This was a robust red made from the Tempranillo grape and aged for 8 months in oak. I am nearly always impressed with reds from the Douro/Duero and find that they are great value. I went with the other main option-Mackerel Green and Black. 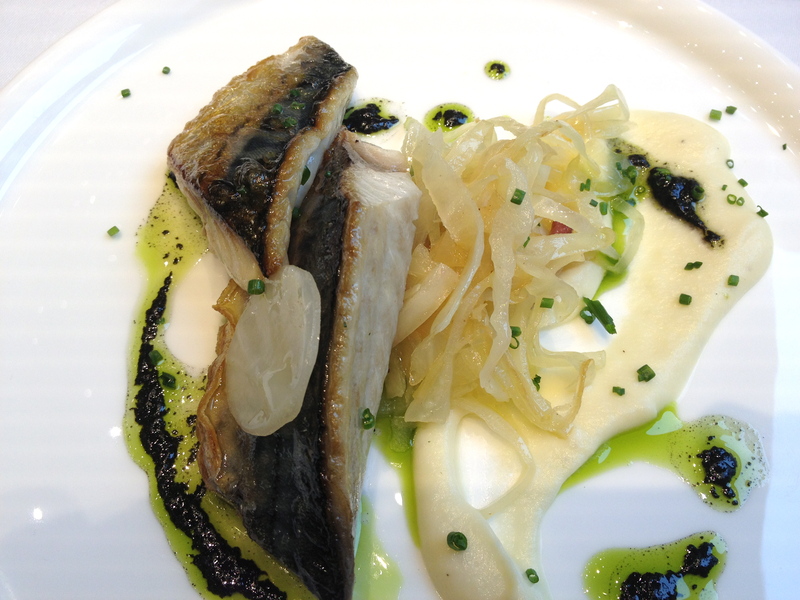 A slowly poached piece of mackerel with a garlic and herb and olive sauce. 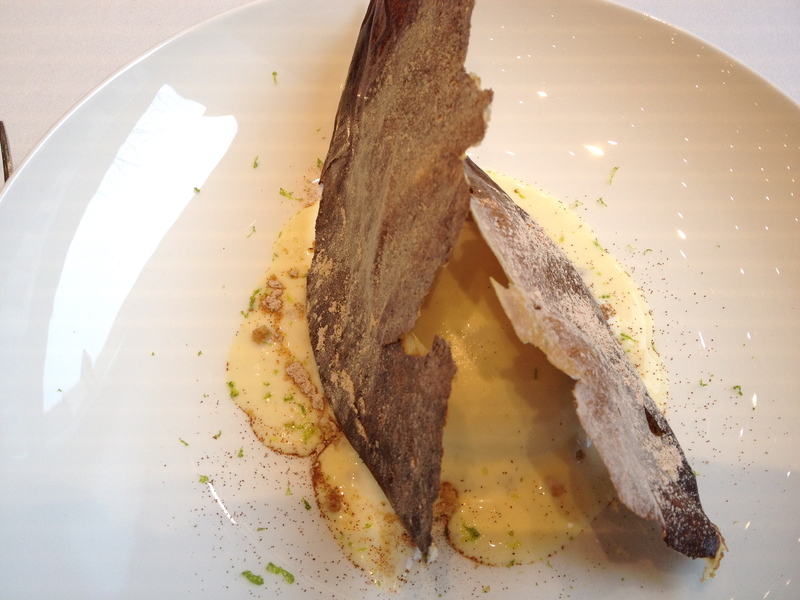 The fish had a richness and depth of flavour that is not always present in mackerel. I drank a Silencis 2011 made by the Raventos Blanc family in the Penedes region near Barcelona from the Xarel-Lo grape. It was fruity with a hint of smoke and citrus and was a great match for the fish. For dessert we chose Butternut Squash and Ground Cocoa. This had a good mix of textures and the sweetness of the squash worked well with the relatively unsweetened cocoa. Clove Custard with Roasted Pineapple Ice Cream was pretty delicious. The clove custard had a subtlety that didn’t overpower the pineapple and the thin chocolate wafer added a bit of cocoa crunch. There was some top-class cooking on display at Ametsa and some disasters. I also don’t think they have a clear idea of how the London market works. A tasting menu at this price should use some better ingredients which it didn’t or else be brilliantly executed which it wasn’t. The wine offer should be clearer and although the service was all right, the staff couldn’t always give the level of detail about the food that some annoying customers (like me) want. In a recent Evening Standard article old man Arzak, when asked why they were opening the restaurant said “To capitalise on our brand and make more money.” I wonder if they will? Mmmmnnnn , the jury`s out on this one. I`m thinking ill leave it to settle in a while longer before i reserve a table.I`m heading to Can Roca soon so may as well start off my Spanish eating with a big bang first. Cheers and i enjoyed your review.